Ornamental Pear trees have been recently under attack from a hard to treat fungus known as Trellis rust. Originally from Europe, Trellis rust or European Pear Rust is caused by the rust fungus Gymnosporangium sabinae. The disease may present a serious health threat to members of the Pyrus species, including both ornamental and fruit pear types. Ornamental Pear trees have been popular trees planted for decades noted for their fast growth rate, tolerance of urban conditions, fairly compact shape and white blooms that appear in early spring. Unfortunately, hundreds of trees have been noted dying in Rockville Center and the disease has been spreading to the Nassau and Suffolk County areas of Long Island. The fungus has spread from the mid-western states to upstate New York and Connecticut over the past several years and seems to be getting progressively worse. According to horticulturists, part of the problem is that the trees have been over-planted, resulting in a rapid spreading of the disease. Symptoms to look out for are yellow-orange leaf spots (see photograph), which develop into spores in late summer. The spores can be spread to other host plants by wind or to the roots if the trees are close enough together. The secondary host during the winter months is juniper, allowing the fungus to survive when the pear trees drop their leaves; hence, continuing the cycle in the spring. If you spot damage on your tree, remove and destroy the infected leaves to prevent spores from spreading. If caught early enough, systemic and spray fungicides can be applied to inhibit the spread of the disease. Best preventive measures are to be alert in monitoring your trees, and when in doubt, call a tree professional. True or False? Any dead material remaining from last year should be removed from your garden now. True. It is best practice to remove dead material from the garden in fall to prevent possible pests and disease in your garden. If you have left annuals or perhaps perennials for winter interest, now is the time to tend to them, along with any weeds that might have survived the winter. Pull out any dead remaining annuals and prune perennials back to the ground to encourage new growth. If cold temperatures are still to be expected, push mulch up around the crown of the plants to protect them from temperature fluctuations. True or False? New mulching should be applied now before the ground thaws. False. Mulch acts as an insulator and applying mulch before thawing would actually inhibit warming as temperatures rise. Allow the soil to warm, then apply two to four inches of natural pine mulch. When applying, keep mulch several inches away from tree and shrub trunks to prevent oxygen loss and rotting. Mulch benefits plants by reducing water evaporation, preventing weeds, adding organic matter to the soil and also acts as a buffer, preventing drastic changes in soil temperatures. True or False? Nitrogen based lawn fertilizer can only be applied after April 1st. True. According to the EPA, the prohibition on application of fertilizer between December 1st and April 1st applies to products that contain nitrogen (N), phosphorus (P), or potassium (K). If a product does not contain any of these nutrients, it could be applied during the winter months without violating this law. Explanation: If the ground is frozen, there is a greater danger of runoff and possible contamination of groundwater. Fertilizers applied when the ground is thawed and porous are absorbed and utilized by plant material and go through a natural filtration process before reaching the aquifer system. Please note that there are a variety of organic, natural fertilizers on the market that are more environmentally friendly. Success rate depends on brand and application. True or False? Spring flowering trees and shrubs should be pruned in late winter/early spring. False. General rule of thumb is to prune flowering plants AFTER they flower. Early spring flowering trees and shrubs including rhododendron, azalea, forthysia, magnolia, plum, Eastern Redbud and cherry form their buds from the season before and should be not be pruned until after flowering. Pruning them now will remove flower buds that have already formed, resulting in a loss of blooms. True or False? Summer blooming shrubs such as Spirea and Buddleia should be pruned in spring. True. Mid and late summer flowering shrubs such as Spirea and Buddleia (butterfly bush) prefer a spring pruning to promote fullness and blooms. Prune Spirea slightly for shaping. If the plant is overgrown to the point it is unsightly, it can be pruned more drastically to rejuvenate it now in spring. Buddleia benefits from an early spring pruning and should be pruned all the way back in late winter/early spring to promote fuller plants and better blooms in late summer. This practice is best performed once you see signs of life on your plants. True or False? The best time to prune evergreens is in early spring. True. Evergreens can be pruned anytime when there is no threat of extreme temperature changes that would cause undue stress; however, the best time is either in early spring before they push out new growth, or afterwards once new candles form. When pruning evergreens that form candles, such as white pine, it is best to cut candles in half to keep the plant more compact. True or False? Liriope and grasses should be cut back and divided now in spring. True. Liriope and ornamental grasses can be cold sensitive. Exposing the crown of the plant could be the reason for snow and cold damage. It is best to leave liriope and grasses alone in fall and to prune them back in early spring to allow for new growth. 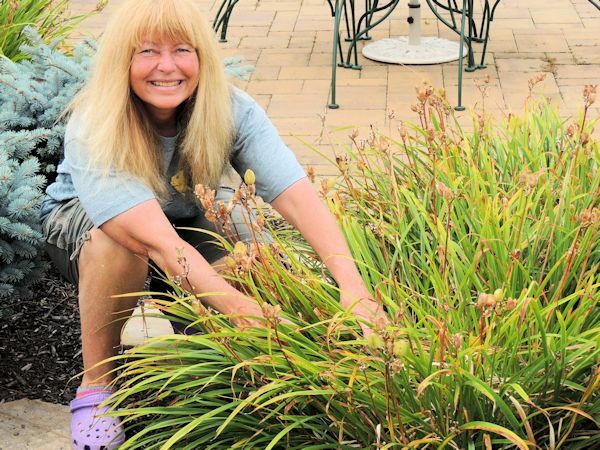 Spring is also the time to divide and move other perennials that have become overgrown. It is recommended that most perennials be divided every four years for best bloom. Dig up and divide with a sharp clean spade just as new growth appears, replant and add a sprinkle of slow release plant food in with the soil to help root promotion. Water in thoroughly. True or False? Knock Out Roses should be pruned back in early spring. True. Wait until your roses are sprouting new shoots and showing some signs of life. Then, prune off dead wood or overgrown branches back about one third the size of the plant to promote strong growth and blooms. Be careful to watch while pruning so that you achieve a nice rounded shape for your plant. Early spring is also a good time to apply an organic slow release rose fertilizer mixed in with the soil at the base of the plant to ensure a successful start to the growing season. I would also recommend a regular watering schedule from the base of the plant, since roses do not fair well with constant water on their foliage. True or False? Summer blooming bulbs should be planted in late spring. True. While spring blooming bulbs such as crocus, hyacinths, tulips and daffodils are planted in fall, late summer blooming bulbs such as Dahlia, Canna and Gladiolus are planted in spring. Amend the soil with compost or manure to insure them a good start and plant in a well-drained area to prevent rotting. Generally, bulbs are planted at a depth of three times their diameter, and specific instructions are usually supplied on the packaging. Once planted, water your bulbs thoroughly and be sure they get watered regularly. Applying bone meal will give your bulbs energy during the growing season, but do not mix in too closely to the roots. Will the unpredictable weather we have been having across most of the U.S. and other areas harm my garden? I have been getting asked this question quite a bit over the past couple of years. Generally, plants are pretty resilient. Buds that are forming on the trees early are sparked by the warmer temperatures in daytime but slowed down by the colder nighttime temperatures, which tends to balance out their progress. If there is severe cold for a prolonged period of time, buds could freeze and get damaged, but the tree produces enough buds to still have a bloom. More sensitive plants like old fashioned hydrangea ‘Nikko Blue’ that bloom on old wood are more susceptible to cold and time will tell. If there is die back on your plant, prune out the dead wood and apply a dose of a high phosphorus fertilizer. It could help to boost larger blooms from any undamaged buds. Hydrangea varieties that bloom on new wood, such as ‘Endless Summer’ and ‘Pee Gee’ should winter alright. Some of my evergreens are a bronze color. Should I be concerned? Winter bronzing is normal on evergreens near the end of winter while temperatures are cold. Once the temperatures rise and new growth is stimulated, the foliage will turn back to a more vibrant green. Broken or dead branches are different in that they are completely dried out and brown. Those branches should be pruned off the tree in late winter/early springtime to prevent any further damage. Any falling or divided tree leads can be arbor tied to secure them and encourage upright growth. Split branches can also be arbor tied together, and if caught in time the cambium growing layer of the tree can mend. In the photograph above, the center upright Western Arborvitae are displaying bronzing and there are no signs of broken branches. As you can see the trees are healthy. 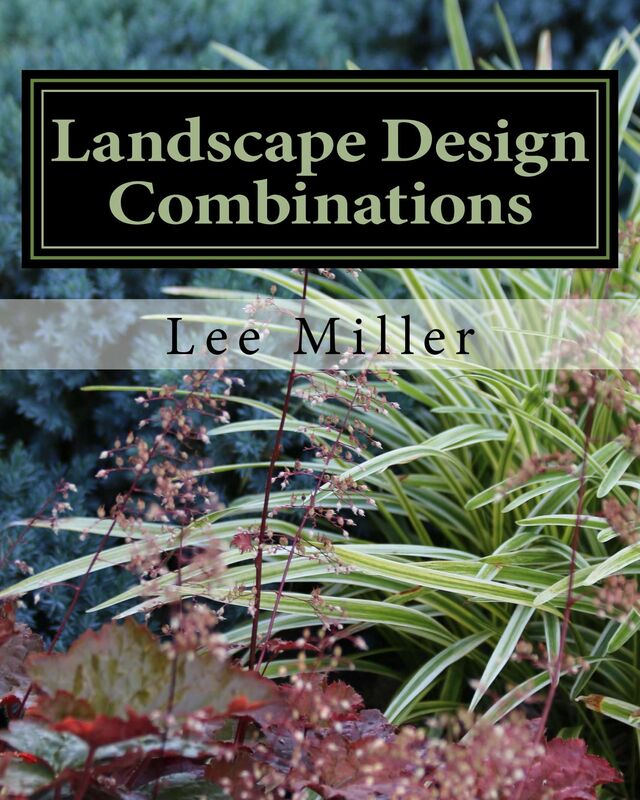 Have you heard about my new book, Landscape Design Combinations? My first book A Guide to Northeastern Gardening covers recommended plants for zones 3-9 with topics including butterfly gardening, deer resistant plants, shade gardening, perennials, trees and shrubs, evergreens, general maintenance tips and more. Landscape Design Combinations is a continuation of the previous publication, with greater emphasis on design, including numerous numbered and labeled photographs of successful landscape plans. Topics include elements of landscape design, designing for the seasons, how to build a natural stone patio or walkway, simple container combinations and garden styles throughout the centuries. Both A Guide to Northeastern Gardening and Landscape Design Combinations were written to provide you with the tools needed to help you to create a successful garden. Click on the links below for more information and previews. I hope to inspire you! The seasons have been shifting in the northeast, leaving many homeowners in much dismay when it comes to winter garden maintenance. Winter storms can hit late winter into early spring, causing more distress to plantings once they have experienced warmer than normal temperatures. As we await another winter storm, there are some precautions you can take to ensure the vitality of your landscape plants and protect them from possible damage. SNOW WEIGHTED TREE BRANCHES: Most evergreen trees and shrubs can handle snow build-up on their branches, but in the instance of a heavy snow, the branches may become weighted down. Certain Arborvitae are susceptible to the weight of snow pulling down on them and may have already experienced sagging branches. Further damage can easily be avoided by wrapping the branches together with arbor tie. The cloth tie cannot be seen from the outside, will prevent future damage from another snow, and the tree will look unscathed. BROKEN OR DAMAGED TREE BRANCHES: Before an approaching storm, try to walk outside and inspect trees and shrubs on your property for any broken or damaged branches. If you do spot a damaged branch, tie the two split halves together by wrapping them tightly together with arbor tie. Start by wrapping the two halves tightly together and continue wrapping above and below the crack for extra support. If caught in time, the cambium (or growing layer) of the plant will repair itself and fuse the two parts of the damaged branch together. I have personally saved split branches on holly, azalea and arborvitae using this technique and the plants have recovered beautifully. Identifying these issues now and tending to them prior to the snow can mean the survival of your plant. SNOW REMOVAL: While it is tempting to go outside and start removing snow from weighted branches it is also a good time to exercise caution. Under the snow-covered branches could also be a frozen layer of ice. Any manipulating of the frozen branches could result in easy breakage and permanent damage to your tree. A helpful tip is to very carefully dig snow from around trapped branches and allow them to spring back up on their own. Never shake branches with ice. It is best to let nature take its course and allow thawing to occur. The branches will gradually regain their shape as the ice melts preventing any harm to your landscaping. SPRING BULBS AND SNOW: Just as your spring bulbs are emerging, a late winter snow storm in March can cause much distress and uncertainty. Besides having to tend with the snow, there is some reassuring news! While mulch protects dormant bulbs from cold, once they start blooming, a covering of snow will act as an insulator. The snow will help to hold in the natural warmth from the soil and provide protection. Once the snow is gone, you can continue to enjoy your bulbs! As mentioned previously, plants are very resilient, and with a little care can bounce back and recover nicely after a major snow. With a March snow on the way, warmer days may not look promising at the moment, but Spring is right around the corner! Author: Lee@Landscape Design By Lee 2017. All Rights Reserved. Recently I have been noticing a rash of trees that have become victim to the dangers of “volcano mulching”. Volcano mulching refers to the piling up of mulch around the base of trees causing moisture to build up around the trunk, rotting out the tree and leading to a slow death by suffocation due to lack of oxygen exchange to the roots. 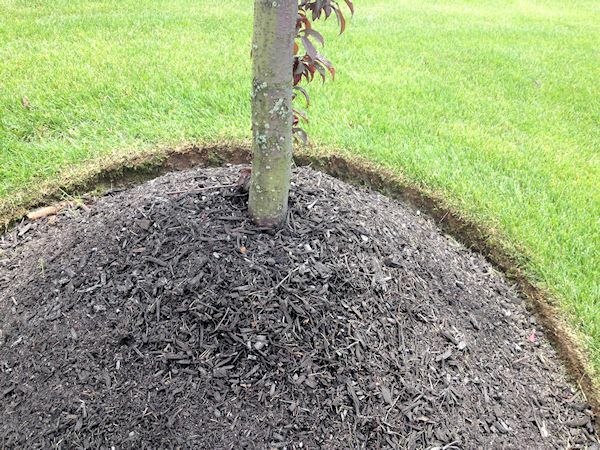 Proper mulching involves adding a protective layer of organic mulch approximately 2-4 inches thick, keeping the mulch about six inches away from the base of trees so to avoid build up. Mulch has many advantages including the addition of organic matter to the soil, allowing moisture retention for the plant and helping as a weed barrier to keep weeds down as well as adding an attractive finishing touch to garden beds. Signs of tree suffocation are indicated by a darkening of the trunk with patches of blacked spots going up the tree. In Photograph 2 you can see where approximately six inches of mulch had been piled up on this tree causing the tree to already start rotting. 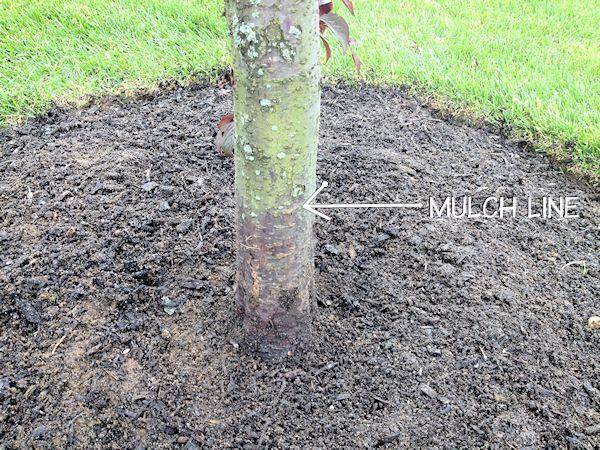 When removing the mulch it should be to the level of the tree collar (where the base of the tree starts to flare out). Even routine mulching can gradually build up so it is recommended to remove some of the older mulch if necessary before applying a new fresh layer. This tree should now be fine since the mulch was removed and the base of the tree will be allowed to heal and the health of the tree restored.